Hi it’s Janet, I love the new Stamp of Approval Collection – instantly falling in love with the Cabana Tiles die! As soon as I saw this die I had loads of inspiration and just had to make lots of cards. See all the other inspiration with the Tropically Yours collection HERE. I used a sheet of the gold card from the Tim Holtz metallic paper pad and die cut all the Cabana Tiles dies out twice – my dies are still all connected. I wanted to make a corner design, so using only the frames of the hexagons, I placed them around the card panel and rearranged them to make pleasing design. I then used a sentiment from the Zen Feather Stamp set by Catherine Pooler and stamped this with Black Jack ink just slightly to the top left of a Catherine Pooler pre-scored card base to fit between a couple of the hexagons. Keeping the die cuts in place on my card, I adhered each of them to the card panel with liquid glue and placed an acrylic block over them to hold the dies place. (If I was to make this design again, I would use the Stick It double sided adhesive sheet before doing any diecutting to make adhering the hexagons easier). And my card is finished! This is such a quick clean and simple card to make but the metallic gold adds a touch of elegant glamour. 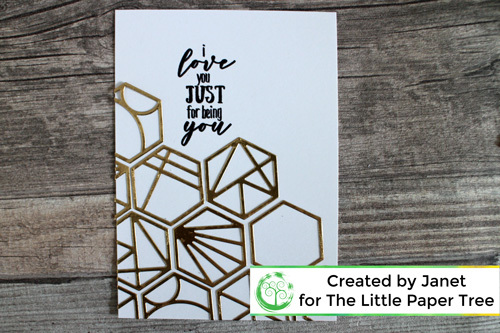 You could easier make this an inlay diecut style card and use a different colour of card for the insides of the hexagons. Are you a gold lover or are you more into silver? Have you joined our Tribe over at Facebook? We are a friendly group for sharing your makes, tips and tricks and asking questions.